In our Elevate CA series, improving public education has been common theme looking at how California can address the income inequality issue across the state. For Santa Barbara Unified School District Board Member Laura Capps, one necessary step to improving student performance is to make sure that school children are being fed. Capps argues many more are eligible for programs than are taking advantage of it. It’s pretty hard to focus on geometry when your stomach is growling from hunger. Yet across this great state of ours, too many children start their school day off hungry. Food is a fundamental of life. We know that when children are sustained by healthy meals they are far more likely to learn and thrive. According to studies compiled by the California Food Policy Advocates, beginning the school day after a nutritious breakfast has a positive impact on memory, motivation, cognitive function, emotional health and academic achievement. Conversely if a child regularly skips breakfast, he or she is more likely to face challenges of delinquency, tardiness, aggressive behavior and the risk of obesity and diabetes. Thanks to the national school meal program established in 1946, all children who live in low-income households are entitled to free or reduced lunch and, in recent years, breakfast. The cost of the food is reimbursed to the school district by the federal government. The days of greasy, fattening cafeteria food served from microwaved packets or fried to the crisp are soon becoming a thing of the past. Thanks to the leadership of Michelle Obama and school districts like the Santa Barbara Unified School District, the norm is moving towards food that is prepared from scratch and include vegetarian options, salad bars, and lean protein to fuel active and growing bodies. What does that mean for California? Three out of five kids in public schools here are eligible for free and reduced meals. But despite our outreach efforts, one million kids who need it are missing lunch and an additional two million are missing out on breakfast. Since the food is paid for by the federal government, this is one rare challenge that isn’t resource driven. In fact, California public schools are literally leaving $340 million dollars on the table in federal reimbursements in every year that their breakfast enrollment falls short of their lunch enrollment. So why are three million California kids missing out on the breakfast or lunch they are entitled to? One reason is simple: To enroll in the program requires a somewhat cumbersome form to be filled out that must include social security numbers of parents and their salary information – known barriers to participation. A second reason is timing: Breakfast is often served before school busses arrive. It also means kids must face the stigma of arriving early to join other ‘poor’ kids who need a meal handout. It is no wonder that participation in free breakfast programs decreases as kids get older and more cognizant of the social ramifications of being in the cafeteria before school starts. How do we fix this? There are two solutions. The first is requires improved information technology. The second requires schools to be more creative. Direct Certification with Medicaid: One way to eliminate the additional enrollment form is to set up a match with Medicaid recipients. The reach of Medicaid is significant: one in three Californians are enrolled. So, transferring that data to the school food program would allow paperless enrollment for hundreds of thousands of students. It also means less paperwork for states and schools. This year, the California Department of Education began offering this direct certification for districts that can undergo the required training. That means it is yet another thing that district staff need to take on top of all the other pressures they face. Thus, school boards and need to make this a priority for their school administrators to pursue. Breakfast after the bell: The best way to reach kids who aren’t receiving the free breakfast they are entitled to is to make it part of the regular school day, rather than the traditional approach of before the school day begins. 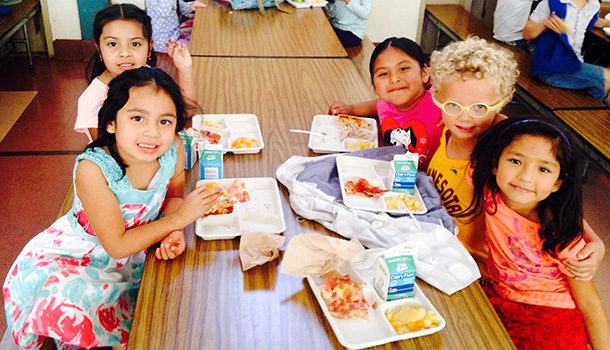 “Breakfast After the Bell” is an approach championed by anti-hunger experts, and an increasing number of districts and states, including Los Angeles Unified School District. This model means that breakfast can be served in a variety of ways – most commonly in the classroom and incorporated into the learning curriculum. Or it can mean a ‘grab and go’ approach that provides packaged breakfast from food carts served as school starts or in between periods. Lastly there is the option more popular with older students called ‘second chance breakfast’ which is served midway between the start of the school day and lunch. These approaches can be further explored here. If we pursue these two solutions, California’s future will literally be stronger by three million kids who will get more out of their school day and lead more productive lives. We not only can do this, we must do this.